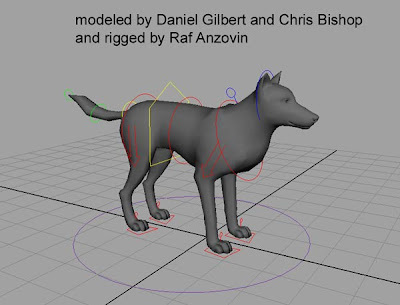 This rig is available @ Anzovin Studio as a .zip file here, just like their Wolf rig. 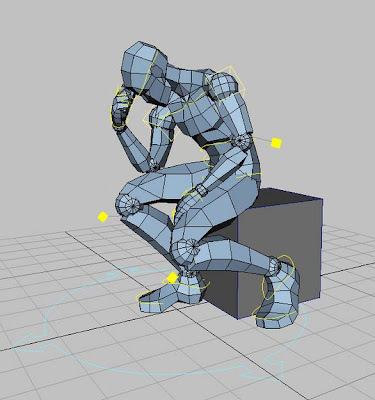 After slogging out all the remaining problems, I've finally got The Setup Machine 2 for Maya to the point where it can make a rig fit to be used by other people. :) So I'm posting this rig free to the net. Take a look, tell me what you think, use it for anything you want. 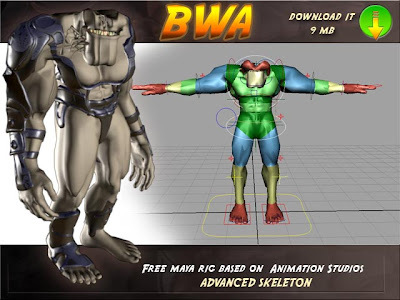 It's designed to allow a great deal of real control over a character's shape, allowing you to squash and reshape pretty much any part of the body. 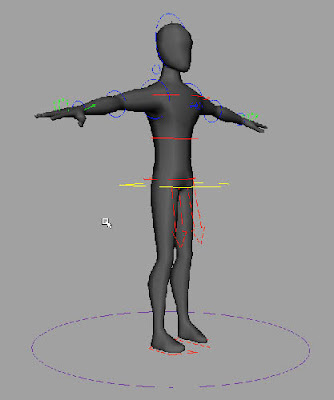 This rig is in a Maya 6.5 .ma file. It should work fine with 6.0 if you change the headers, but it won't work with 5.0. This rig is quite old by now, but it's still working fine. Don't expect any fancy stretchy IKs, there isn't even a facial setup, besides a jaw up/down function. But it's light and fast and would work well for physical animation or learning mechanics. 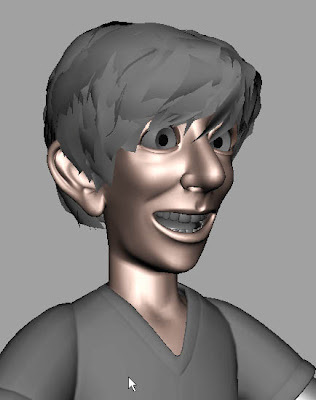 Go to Premiere Press Books' page for "Inspired 3D Character Setup". You get the rig for free if you buy the book, but they also let you download it without getting the book. Click on the "Downloads" link and it will bring you down to a list of downloads. 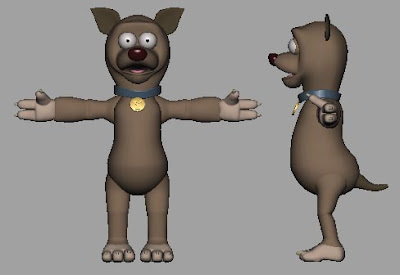 You get MEL scripts, Models and Rigs. 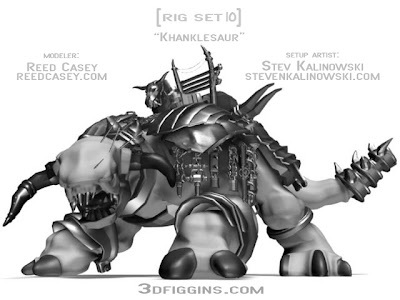 You have to rig it yourself of course, but there are free auto-rig setups online (there's a really good one, but the name escapes me right now... something with skeleton...). One that I haven't tried is Supercrumbly's "abAutoRig 1.9.1". Or you get the rigged version, which is lo-res (just do a "smooth" poly for the head). The link for this rig is here. You can always parent the hi-res geometry to the lo-res rig, but again, no facial setup besides the jaw up/down, unless you create your own blendshapes using the hi-res head, which could be fun. 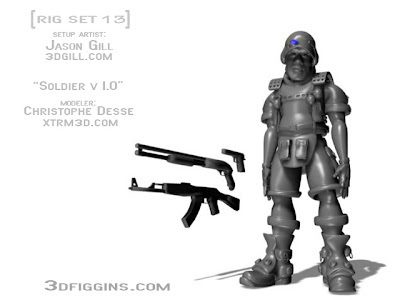 This rig is by Nathan Tillett and looks great. He mentions though that the arms have no polevectors and I also noticed some funky enveloping in his hip area as well as pants. Make sure to leave comments, it would be great to have a more polished version. 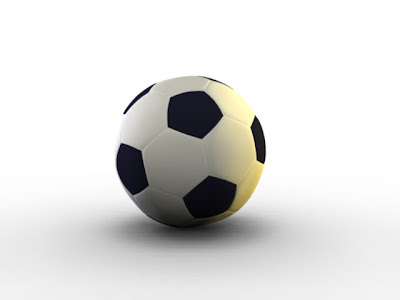 Go to Abel Cabrerizo's site and click on the soccer ball image for the download. The ball has separate CONs for rotation and translation, a separate controller for squash and stretch, as well as a low, medium and hirez geometry swapping feature. 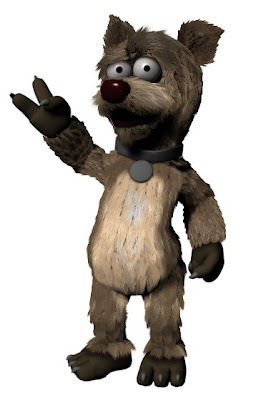 I just did a quick render of it but it looks like this rig comes with fur. You can download it here, courtesy of Abel Cabrerizo. [Update] I found the official site for the download here. 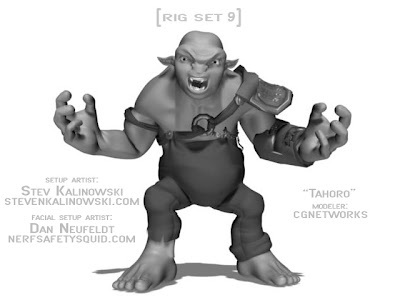 This is another rig for which I can't find a link on the official site, but animationlounge got this one. If it is not for public use, please let me know. 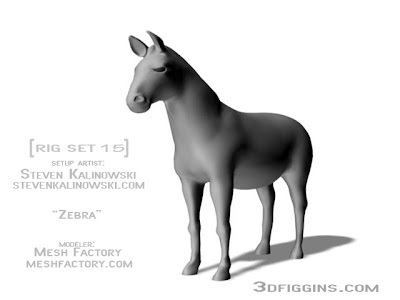 Bob was created by Greg Towner and although his site is down you can still download the rig @ animationlounge. Update: seems like the link is dead now? I'll try to find a copy that I can upload. You can download the file from mutinystudios. I found it via davidelasala.com, which links to that zip file. The mutinystudios site however does not have a page or link to that character. I didn't see any disclaimers on their site nor on David's, but if this rig is not for public use, please let me know. 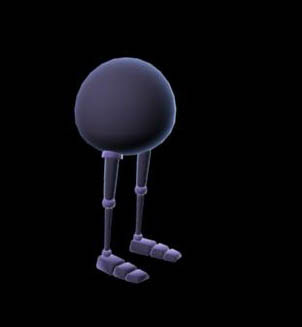 The rig reminds me of the ball with leg character from Animation Mentor. This one comes with Footroll, Toepivot and Toetap controlls on the feet, as well as Stretch, Bend, Bendrotate for the body and Legstretchers. Included as well are shaders for a nice render out of the box. Here you can see a test animation. 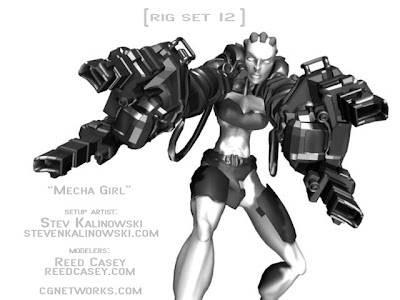 The BlueLayout rig is based on the MrMotionRig. 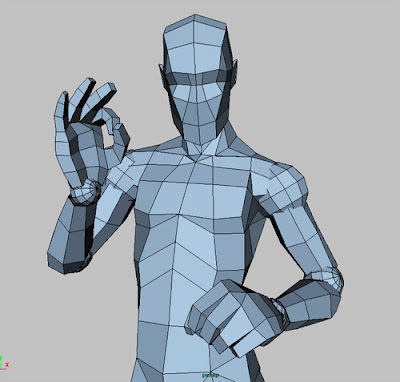 It is a biped rig designed for intuitive animation. It can be used to exercise your animation skills. All the animation controls are nurbs-curves. BlueLayout uses the Character Layout script. You can not adjust this rig to fit inside another character. Another rig on mrMotion.net, with a facial control video demo here. 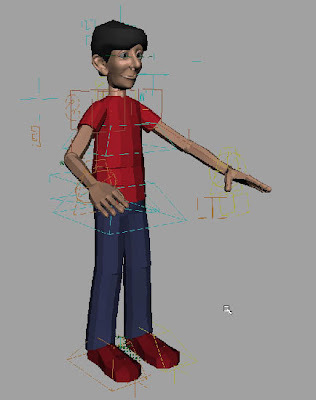 You can get the Ralph Demo Rig by coing to character-setup.com. 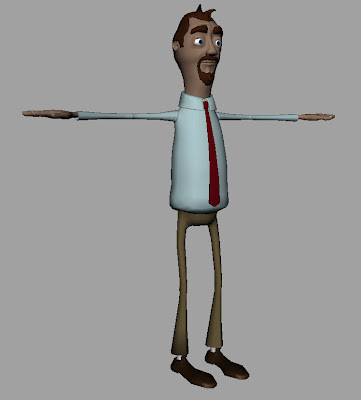 It is part of a character setup tool. Once you follow the link you will get prompted to enter a username and password. This is the only pic of Ralph so far. mrmotion.net has a description on how to adjust the rig. You can also watch a tutorial video here. You used to be able to download the rig of Miguel Gonzalez Vine's site Lichiman, but the site is a bit funky right now. Until then, get it from here. 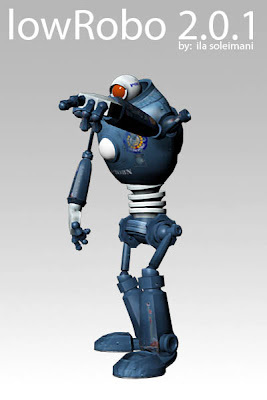 Animation examples can be found @ Rodri Torres' site. 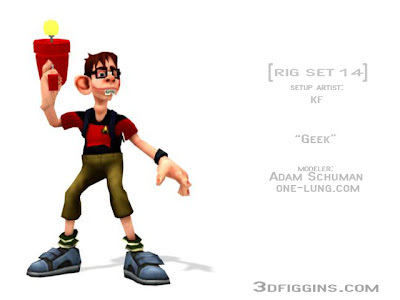 Download the rig directly from here. 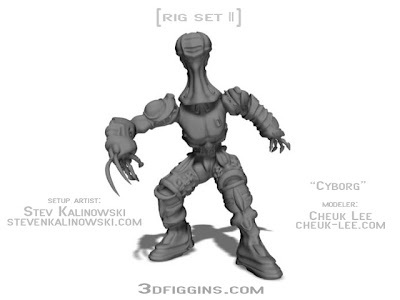 The rig comes with textures and is available for 3D Studio Max as well.